#BantryBay - MS Prinsendam of Holland America Line made her maiden call to Bantry Bay Harbour writes West Cork Times on what was to be the first visit of a cruise liner to Bantry in almost 30 years. Carrying more than 800 passengers, MS Prinsendam arrived in the early hours of the morning and will stay until evening ensuring their passengers get every opportunity to explore the region. Speaking about the arrival of MS Prinsendam to Bantry, Bantry Bay Port Company Harbour Master Captain Paul O’Regan said, “We are very encouraged by Holland American Lines commitment to call to Bantry. This is an exciting time for the whole of West Cork as we aim to grow this cruise business considerably over the next few years. New navigation buoys have been installed at the entrance to Lawrence Cove, near the village of Rerrin on Bere Island, one of the most sheltered harbours in Bantry Bay on Ireland's South–West coast. A marina at Lawrence Cove is located opposite the fishing port of Castletownberehaven at the North side of Bere Island. Lawrence Cove Marina is the only fully serviced marina between Kinsale and Cahirciveen making it an important stop–over location for cruising yachts. Total traffic through the Port of Cork and Bantry Bay Port Company in 2015 reached a total of 11 million tonnes. Total Trade traffic at the Port of Cork reached 9.8 million tonnes up a significant 10% on 2014 traffic figures. Bantry Bay Port Company dropped slightly from 1.3 million tonnes in 2014 to 1.1 million tonnes in 2015. These figures are extremely positive for the port and show trade is beginning to return to pre-recession times. Total container volumes through both Tivoli and Ringaskiddy Container Terminals in the Port of Cork grew by 8% compared to 2014 figures with over 205,000 TEU’s handled. This is very encouraging particularly as the Port received planning permission to move all container operations to Ringaskiddy in the near future. Dry bulk cargos such as animal feed, increased by 2% in 2015 while fertilisers and cereals both decreased slightly. Liquid bulk cargo, predominantly the oil traffic through Whitegate Oil Refinery, currently owned and operated by Phillips 66, continues to have a significant impact on the overall traffic through the Port of Cork with oil traffic in 2015 showing an increase of almost 20%. This significant increase in 2015 is attributed to an increase in demand from the domestic market as recovery takes hold and due to maintenance shut-down in the Whitegate refinery in 2014 which affected refining for a six week period. Traffic from the Bantry Bay Oil Storage Terminal is operated by Zenith Energy, which accounts for 100% of the commercial traffic through Bantry Bay Port. The Port of Cork cruise business grows year on year with 55 scheduled cruise liners calling to Cork in 2015. In total these liners carried in excess of 145,000 passengers and crew to the region. These transit visitors are an excellent economic stimulus for Cork, bringing a welcome boost to the local economy for eight months of the year. The Port of Cork has completed work on upgrading the facilities at Cobh Cruise Terminal and can now handle ‘Quantum Class’ vessels, which are the largest liners operating in Europe today. The Port of Cork continues to work closely with cruise lines to increase calls to both Port of Cork and Bantry Bay. Brittany Ferries had another very positive year with their seasonal service from Cork to Roscoff carrying 84,378 passengers in 2015. This figure is up compared with 2014 and it is hoped that 2016 will be another busy year for Brittany Ferries when sailings resume. Following a public tender process in November, advance works on the project are due to begin in January 2016. These advance works are a positive step in terms of the Ringaskiddy port redevelopment and will include site clearance to the proposed container compound area which will serve to prepare the site to ensure the main works are not delayed. The next step is to launch the main works tender process in April 2016, with a view to contract being awarded in Q3 2016. It is estimated that 849 FTE jobs will be created during the construction of the Ringaskiddy Redevelopment Project which the Port aims to have operating by Q4 2018. The Port of Cork is committed to seeking out new business opportunities for the Port and in particular, the agri-food business will be a key sector which the Port of Cork is keen to develop. Other areas include the offshore oil exploration field and of course establishing new trade links from Cork. The Port of Cork Schools Initiative is now in its eleventh year and aims to educate 5th class primary school children about the rich history associated with Cork Harbour and to highlight the importance of having a local port to facilitate the connectivity to world markets. The initiative also gives children a better understanding of where cargo comes from and how Ireland, as an island depends on Ports for trading. This year’s theme (2016) ‘A Day in the Life of a Cruise Passenger Visiting Cork’ focuses on the leisure and tourism aspect of the harbour, county and city and encourages school children to see what their region has to offer international visitors. The Port of Cork’s recreational strategy continues to expand with the aim of improving the marine leisure facilities around Cork Harbour and the Port of Cork continues to be an ongoing supporter many of the local harbour festivals and events, local sporting clubs in the harbour and cultural events in the city. 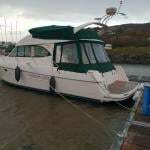 #BantryBay - Sea Explorer I entered the scenic seclusion of Glengariff in Bantry Bay today and where the mere 90m vessel of 4,200 tonnes anchored off Garnish Island, writes Jehan Ashmore. The 114 guest luxury small ship, part of the cruise agency operator Noble Caledonia fleet is according to Bantry Bay Port Company schedule to be the only caller so far listed for 2015. 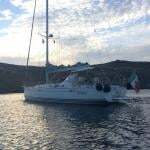 Accommodation of the 1991 Italian built vessel is of 57 spacious suites and all outside with an average of 245 sq ft. Facilities offered are of a high standard albeit on board an intimate sized ship. Yesterday she had been to St. Peter Port, Guernsey again at an anchorage along with Cunard Line's 90,080 tonnes Queen Victoria. The Cunarder had departed Southampton at the weekend to mark the start of the company's 175th anniversary with a celebratory cruise in company down Solent water. Tomorrow she calls to Cobh on the centenary of the RMS Lusitania disaster during WW1. Last month the Port of Cork outlined plans for Phase 1 of the Bantry Inner Harbour Development (incl 20-berth marina) which will be undertaken on behalf of its subsidiary company, Bantry Bay Port Company. Over two years ago Sea Explorer (see photo) arrived to Dun Laoghaire Harbour albeit in a 'lay-up' mode in advance to taking up a European season with cruises starting in June 2013. She is equipped with Zodiacs for expedition landings and for reaching isolated locations. Another expedition / polar cruiseship Fram with 400 passengers and operated by Norwegia based Hurtigruten was understood to be the first caller to Galway Harbour this season. The call of the Fram took place at the end of April and likewise of the 'Explorer' this involved anchoring offshore.